Serenus Johnson Celebrates 100 Years! 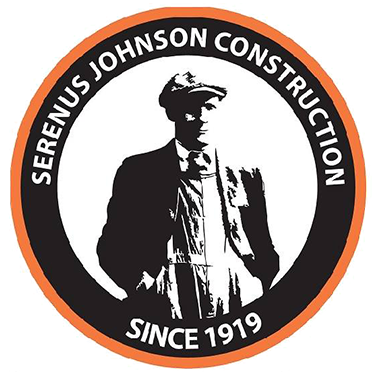 Serenus Johnson Construction has served as a well-respected commercial construction company that has proudly serviced the Great Lakes Bay Region and beyond for the past 100 years. We proudly uphold our founder’s belief in honesty, hard work and quality. Our commercial clients are broad and include historical restoration, healthcare, industrial, religious, educational, retail, business and executive offices and manufacturing. We have been recently awarded with the Leadership and Energy and Environmental Design (LEED Silver), 2017 and the Tax Credit Award, 2017. We work with each customer as individuals, with the understanding that our future success is built on a lasting relationship. We have built a reputation of superior workmanship and open communication with our customers and have learned that our staff must work closely with our clients to assure that all project needs are met. When situations arise, we are quick to respond and have the expertise to find a solution that is fair, cost-effective and keeps the project on schedule. Serenus Johnson employs carpenters and laborers for concrete, carpentry and miscellaneous demolition work and subcontracts the remaining areas of work. Our reputation for honesty and fairness extends to the subcontractors. One of our highest priorities is the solid and long-standing relationships we have with our subcontractors, suppliers and tradespeople. Their knowledge and skills allow us to rise to the challenge on any construction project. Our craftspeople are among the best in the area, providing superior carpentry and finish work. Throughout our 100 years of business (1919), we have implemented procedures that provide consistency on every project and deliver the quality expected, on schedule and at the agreed cost. We have upheld our commitment to our vision and values throughout the years while also making an impact on our community. Serenus Johnson works closely with many local organizations like: The Bay City Morning Rotary Club, Bay Area Chamber of Commerce, The State Theater, Southwest Little League, Bay Future, McLaren Bay Medical Foundation, Good Samaritan Rescue Mission, City of Saginaw Rescue Mission, Delta College Athletics, Bay County Historical Society and the United Way of Bay County. We are proud to sponsor other local events and organizations throughout the year, as well. Each of these organizations works, in their own way, to meet the needs of our area and we are grateful to work alongside of them in advancing our hometown. Over the years, Serenus Johnson Construction has emphasized the importance of lasting relationships, especially familial ties. For 95 years, the Johnson Family owned and operated Serenus Johnson Construction. As a loyal employee for 30 years, Bill Woolwine, Jr has become part of the Serenus Johnson family. Woolwine began as a journeyman carpenter in the field and worked his way up the company ladder. He has served in many additional roles within the company including Project Foreman, Estimator/Project Manager, Vice President and as of October 1, 2014, he fulfills the roles of owner and President. His main areas of responsibility are total oversight of the company and working directly with clients on Design/Build projects. Bill continues to carry out the legacy of Serenus Johnson in his belief of working with a positive attitude, actively being a good communicator, and strives for efficiency in all aspects of the company, which we believe will continue to lead us to success as we build into our next century. Among these beliefs, Bill also shares a strong credence of family ties. Both of Bill’s sons, Billy Woolwine III and Justin Woolwine, have been involved in the company for several years, in addition to his brother, Keith Woolwine, who has been with Serenus Johnson for 27 years, and other extended family members. Serenus Johnson has always been known as a long-standing family company and will continue to carry on its’ heritage in the Woolwine family. As we begin 2019 and are able to reflect on our past, as well as look toward the future of this company, we sincerely thank you for being a patron of ours. We cannot express the gratitude we feel for making us your hometown contractor for this past century. We look forward to joining with you to recognize our milestone this summer, at our 100th Anniversary celebration.